"Hello good sir! Do you have a moment?" a bald man interrupts. 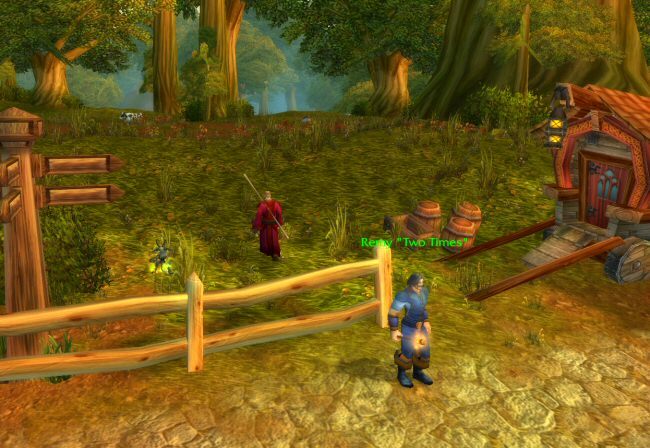 Master Norman and I are getting ready to leave town for a bit and scout out the nearby Fargodeep mine. We're both anxious to get out of the madhouse that is Goldshire, but apparently Norman can't resist a plea for help. "Sure! What can I do for you?" Norman says cheerily. I'm used to his goody-two-shoes act by now, so I only growl a little when he says this. 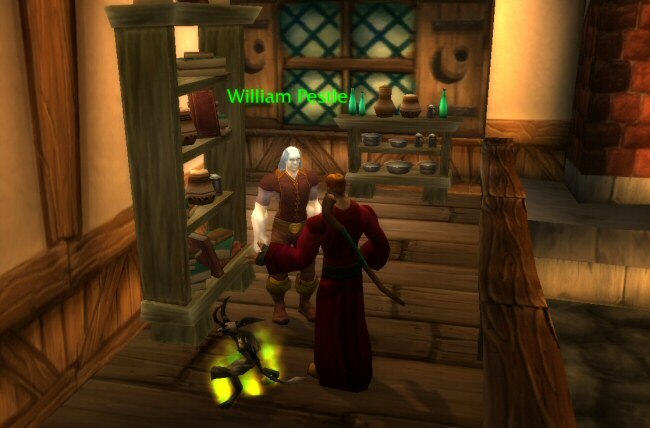 William Pestle gives us the run-down, "My brother and I run an apothecary in Stormwind, and I'm here to gather large candles for their wax. Can you help me?" "Yes indeed!" Norman says, and he produces about a dozen small candles from his pack. "Oh no. These won't do," the man says. "I need large candles." "But ... it's wax," Norman protests. "You melt it and make as many large candles as you want." He looks down at the candle nubs in his hand with doubt. "Hang on, boss," I say as I tug on the fringe of his tattered, threadbare robe. 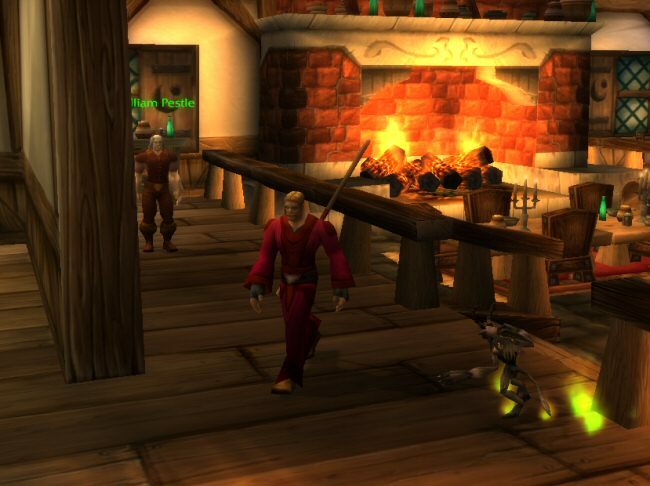 "This guy runs apothecary? Don't they make wax? Why is he buying wax?" "Your very ugly child is wrong," the man says to Norman. "I'm not looking to buy wax. I want you to kill for it. See, the Kobolds around here carry large candles and I'd like you to go in and get eight of them." "But ... I've got all these little candles that I got from different Kobolds just this morning," Norman says sadly. "Are you sure you can't ... you know, combine them?" William Pestle folds his arms and says nothing. "Okay then," Norman sighs. "I'll see about getting you large candles to make candles with. Where can I find the Kobolds?" "They're all over the place in the Fargodeep mine." 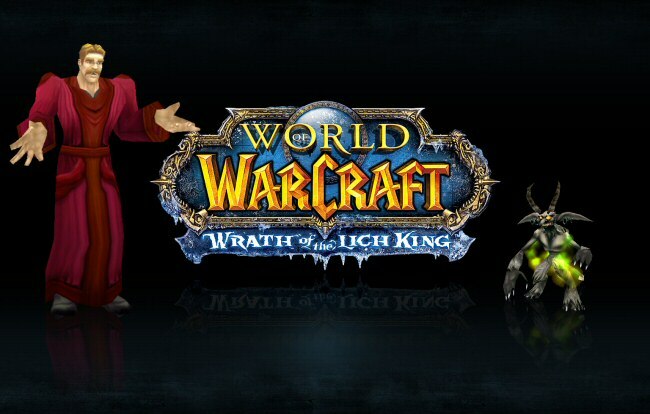 "You're saying you know there are Kobolds in Fargodeep?" Pestle shrugs, "Sure. I think everybody does." "This candle stuff is nonsense! ", I say as we walk away. "This is like a dairy farmer asking you to get him a large glass of milk because he only has six small glasses. What kind of messed up world of squealing lunatics have you summoned me into?" "Why would Marshal Dughan ask me to scout the mine if everyone already knows it has Kobolds in it?" Norman mumbles to himself. I think Norman is about to learn an important lesson in not being such a rube, so I don't tell him what I think. So we're on our way to Fargodeep mine. Norman dithers about and talks to a few more dullards, and then we head south into the wilderness. The place is about a two minute walk out of town and is overrun with filthy little Kobolds.